There have been movies and TV specials about Our Lady of Guadalupe before, as we outlined here in December — but none of them was a big Hollywood feature. Now, that’s about to change. As reported by Deadline.com, veteran screenwriter Joe Eszterhas (“Basic Instinct,” “Nowhere to Run,” “Flashdance”), a Hungarian-born Catholic, has penned a new script about Juan Diego’s vision of the Madonna in 1571 Mexico, and taken it to LightWorkers Media, run by Roma Downey and Mark Burnett. Through Lightworkers, the movie will go to MGM, where Burnett is also president of television and digital media. Eszterhas had been working on the script long before the faith-based push became popular at Hollywood studios. The thought about writing a screenplay about Our Lady of Guadalupe came to him 14 years ago during what he calls his life-changing “Christian conversion.” The screenwriter would later write a book entitled Crossbearer to share his story about that moment sitting on the curb in his cul-de-sac in 2001 at his wits end after battling cancer and addiction. A man who was once the highest-paid screenwriter in Hollywood with a wild lifestyle was now feeling defeated, and found himself begging God for help. That’s when something other-worldly happened. 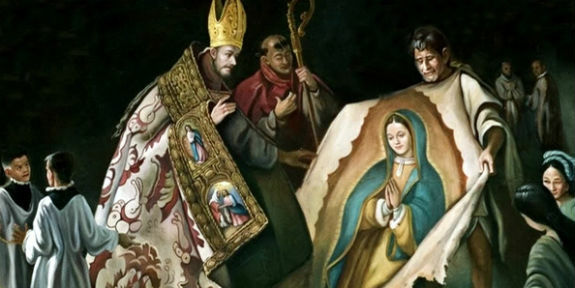 When he regained his health, Eszterhas traveled to Mexico City to do research and to pray to Our Lady of Guadalupe to help him become a messenger for God. The end result is the spec script that Lightworkers just picked up. Eszterhas told Deadline that his wife, Naomi, inspired to write the script about the Blessed Mother as she herself, felt a closeness to her. Downey herself played the Blessed Virgin Mary in both Son of God and the TV mini-series The Bible. As soon as we get an idea of casting or a release date, we’ll let you know.